The end of this month will see Cassandra Clare's The Mortal Instruments series conclude with the sixth book, City of Heavenly Fire. I admit that I'm a bigger fan of her Infernal Devices series, but TMI was my introduction to the Shadowhunter world, and I'm still a bit sad to see it end. I read the first four TMI books pre-blog, and rereading them and reviewing them have always been near the top of my blogging to-do list. It bugs me whenever I see the link to Book 5 in the Review Archive, there all by its lonesome self. I need to fix that. 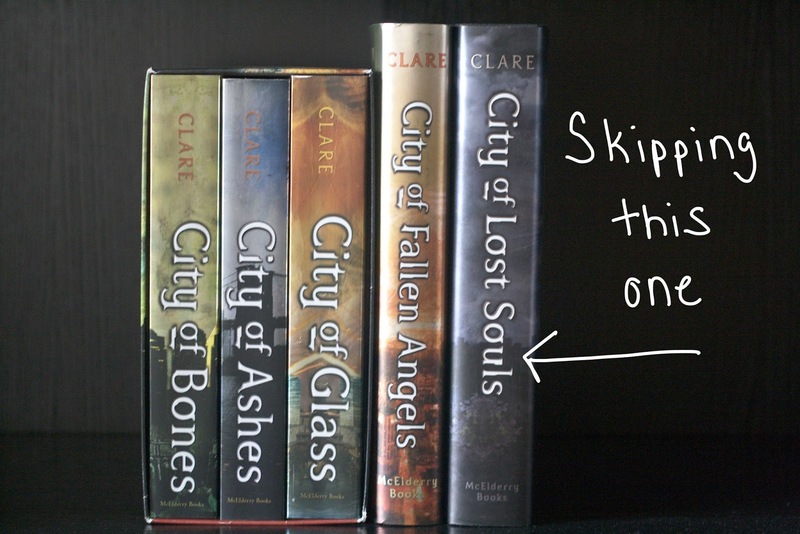 City of Lost Souls is actually still pretty fresh in my mind; I paid extra, extra special attention while reading it because I was on the lookout for any references whatsoever to The Infernal Devices. Plus, Ally and I jointly reviewed that one, so I figured I'd brush up on what happened in Books 1-4 only and review them. I might do an update or two on the progress of the reread, time permitting. Ally and I are planning to do some kind of post to mark the end of TMI; we do love speculating on how a series will wrap up. It has been such a LONG wait. I'm so ready for the next book even while I'm sad to see it go. I have to know how this series wraps up. I feel the same way about all the books that I read before blogging with no reviews set up. Have fun with the re-read! Jaclyn @ JC's Book Haven. The last book is 700+ pages, and I'm excited to read every single one! As I was writing this post, I realized that it's been two years since City of Lost Souls already; the time has flown! I'm excited for the last one too, I heard Tessa is going to make a special appearance and though I'm sad to say goodbye to the characters, I'm anxious to bid farewell to emoClary and Jace. Sorry babe, not a fan of those two. I think what I'm most looking forward to in this book is seeing how many characters from The Infernal Devices make appearances, lol. I've never been a Clary fan; I liked Jace a lot in the first three books but not so much in the fourth. He got it together a little bit in the most recent one, but he really needs a strong finish in this one to win me back. Road Trippin' to UtopYA Con!